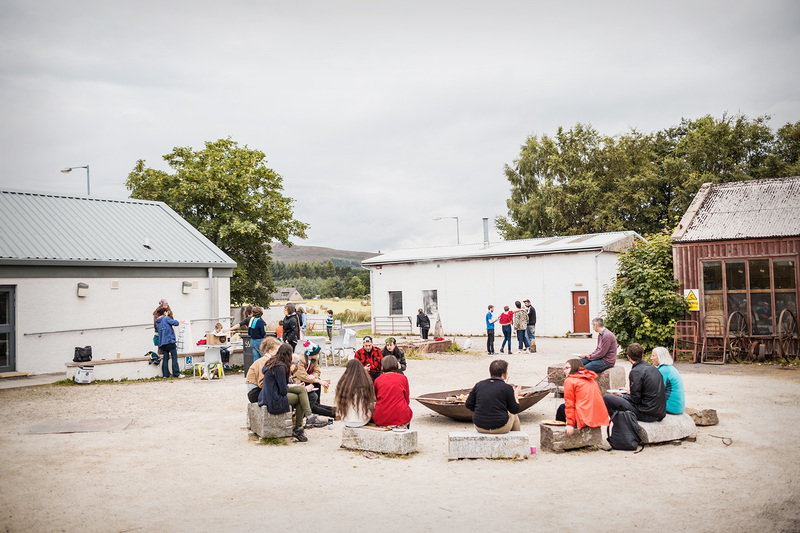 SSW is based around the facilitation of artist Residencies, the delivery of Projects and the provision of Facilities, as well as offering Open Access to workshops for all. Running as an Open Access facility is important to us; offering opportunities for artists to make their work, regardless of background, practice or professional status. To celebrate the SSW facilities and ethos we will open our workshops for the weekend and provide a space for skill sharing and artist-led activities. 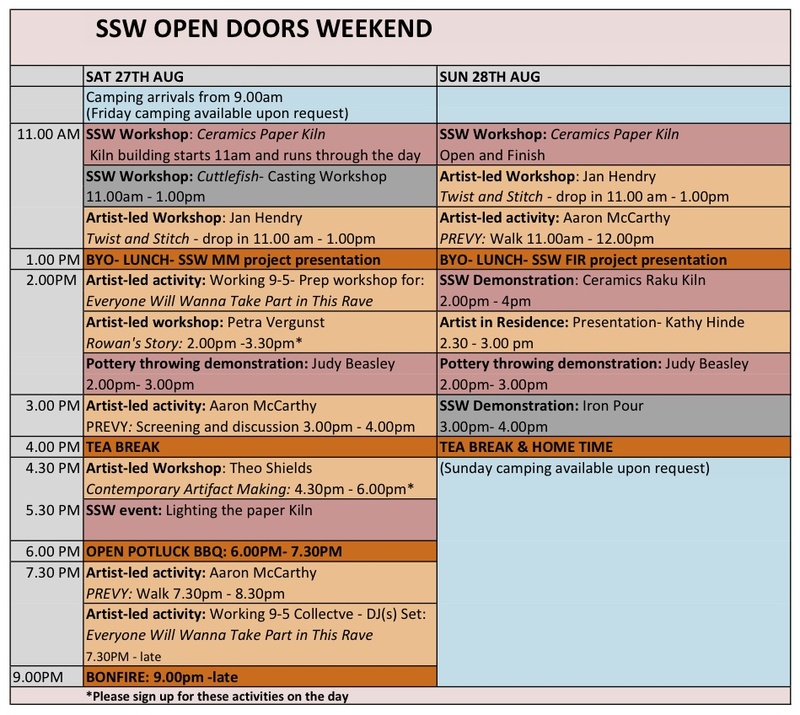 The SSW Open Doors Weekend will take place on the last weekend in August. We welcome people to come along, get involved, try their hand at something new and maybe come back for more. During the weekend we have programmed a number of workshops, activities and events, which will give visitors a good overall insight into what happens at SSW. From outdoor ceramic firings and metal pours, to project presentations, discussions and walks. Our current Artists in Residence will be opening their studio spaces and sharing their practices and experiences of SSW, and we have also commissioned a number of artist-led projects through an open call. INFO: SSW Ceramic Technicians Beth Bidwell and Heather Fulton will lead a workshop with participants to build a paper kiln and fire ceramics. Please feel free to bring your own bisque fired ceramics. A limited number of pre-made and bisque fired ceramic pieces will be available on the day for people to work on. TIME: The building of the paper kiln will take place over the Saturday. It will be lit Saturday evening and opened Sunday morning. INFO: SSW Technicians Eden Jolly and Uist Corrigan will lead a workshop sharing one of the simplest casting methods, Cuttlefish Casting. Participants will have the opportunity to carve their own cuttlefish casts and pour pewter into the casts. TIME: Workshop Saturday morning from 11.00am – 1.00pm. TIME: Saturday Only. Workshop starts 2.00pm at SSW but will take place offsite within walking distance from SSW, returning to SSW at 3.30pm. Please book on the day. TIME: Saturday Only. From 4.30pm -6.00pm. 10 participants Maximum. Please book on the day. TIME: Film screening and discussion Saturday 3.00pm. Walks Saturday evening and Saturday morning. INFO: Working 9-5 is a collective made up of full-time workers based in the North East of Scotland. With an interest in after-office-hours social activities, Working 9-5 will be facilitating a DJ(s) set entitled Everyone Will Wanna Take Part in This Rave. Working 9-5 will also be onsite during the day making decorations, props and costumes for the DJ(s) set. Anyone can join in. The DJ(s) set will be democratic with an open-tab Youtube playlist where anyone can select the next party banger to be played. Artists involved in Everyone Will Wanna Take Part in This Rave are Joss Allen, Rachael Disbury, Catrin Jeans and Fraser MacDonald. TIME: Saturday Only. Collective Making workshops from 2.00pm onwards. DJ(s) set starts 7.30pm. INFO: SSW Ceramic Technicians Beth Bidwell and Heather Fulton will prepare and demonstrate a Raku Firing that they have been working to develop over the past three months of Heathers Internship. INFO: Judy Beasley is a skilled potter and expert thrower. She will be demonstrating her throwing technique and giving a few people the opportunity to try it themselves. INFO: SSW is famous for its artist foundry and Technicians Eden Jolly and Uist Corrigan, along with some assistance from our Artists in Residence with demonstrate an outdoor Iron Pour. INFO: Kathy Hinde, Andreas Borregaard and Maja Ratkje have been at SSW working in collaboration as part of a Red Note Ensemble project. Kathy will present some of the groups findings and the work they have developed during their residency at SSW. TIME: Sunday Afternoon at 2.30pm. INFO: SSW will be offering soups at Lunchtime but asks people to bring their own sandwiches/ snacks. Over Lunch SSW invite you to join them for a lunchtime project presentation where Director Nuno Sacramento and Project Manager Yvonne Billimore will share examples of current SSW projects. INFO: In true SSW fashion we invite you to participate in a Potluck- bring and share BBQ. We will provide basic provisions but encourage contributions. We will open the SSW studio and share the work of our current Artists in Residence Roi Carmeli, Fran Gordon, Svava Thordis Juliusson and Rachel Reid. 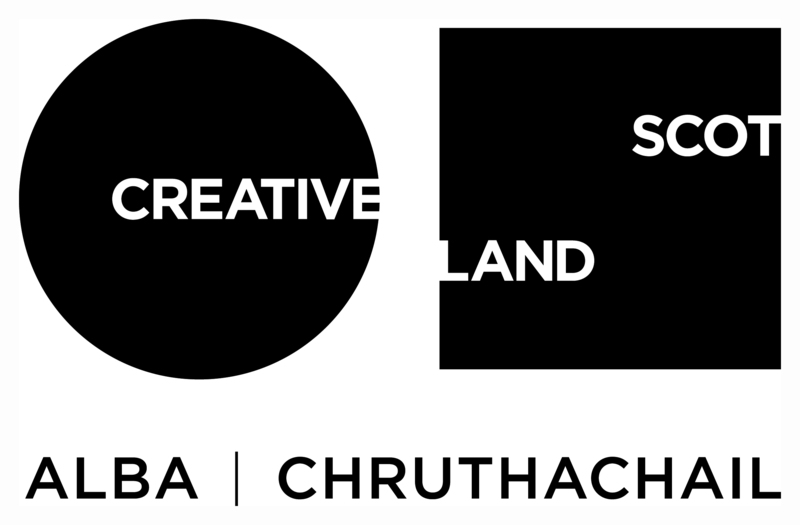 This group of international artists will be at three week point of a month long residency and will be available over the weekend to answer any questions about their work and their time spent here in Lumsden. On both days staff will be available to give group tours. Tours will be arranged at convenient times throughout the day. 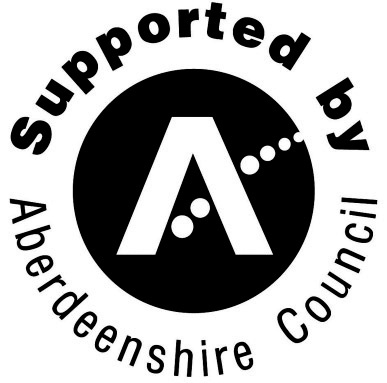 There are plenty of walks around the village and wider area of Lumsden, including the villages Sculpture Walk. Please ask Staff for advice, directions and maps. All activities are free and suitable for people of all ages. Some workshops require booking but bookings can be made on the day. For more information or questions please contact arts@ssw.org.uk/ 01464 861372. If camping over the weekend please contact us to let us know.